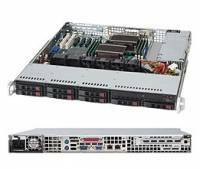 1U SuperChassis 113M Supermicro's SC113M packages outstanding high end performance into an astonishingly short 20" deep chassis featuring advanced air flow/thermal design for space-limited applications. With its short depth, it efficiently packages 8 hot-swap 2.5" SAS/SATA hard drive bays into a compact 1U form factor. This chassis features our new advance design 560W high-efficiency power supply (Up to 90%+ power efficiency).